I love trails. I love everything about them. To where they take me: tops of mountains, deep forests, sometimes nowhere in particular. From where they take me: people, troubles, worries, life. I love them for the challenge: the rocks, mud, roots, stream crossing and sketchy bridges. I love their meanderings, their switchbacks, their straight up or down sections. My friend, Wes, hates trails. Avoids them like the plague. Thinks they’re a waste of a perfectly good day. It’s not that he is not into the great outdoors–quite the opposite. He is more passionate about the mountains than almost anyone I know. 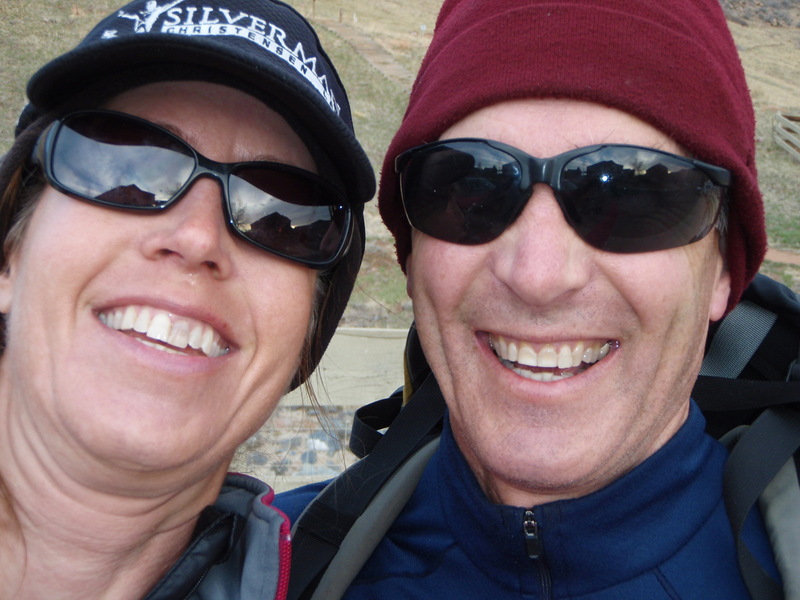 I can only hope to climb even half what he has–climbing all the 14ers twice is but the start. But Wes’s preference is off the beaten trail: bashing through the willows, jumping over fallen trees, climbing boulders, navigating by ridge line and gully. Hiking with Wes, I have learned that trails are not all that challenging. I have lost two hats and torn pretty much all my favorite hiking clothes hiking with Wes. I have new scars and bruises that raise eyebrows, which I wear with pride. I cannot always say I love it, but there is something there, something that keeps drawing me off trail, despite the blood and clothing loss. Last year, Wes presented me with a project he’d been thinking about for awhile. He wanted to hike from Golden, CO, to the Eisenhower Tunnel, map and compass only, staying on the ridge lines, summiting the high points. All off trail. Each day would be a point-to-point. The subsequent hike, we would park one car where we finished the last day, and drive the other to our new exit point. We would hike back up to the last high point, then start into uncharted terrain. I’m never one to turn down a good challenge. We met a couple of times over the winter to plot a general route. 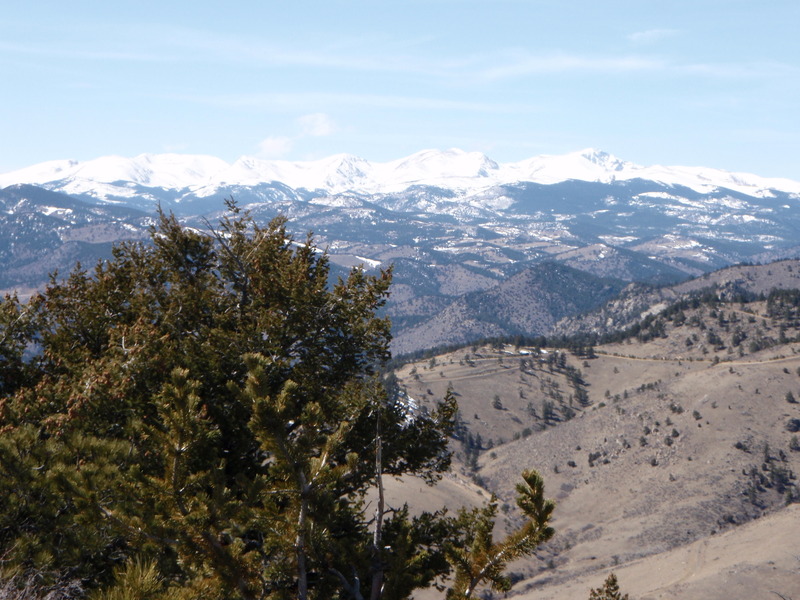 We found the neighborhood in Golden that looked to be a promising starting point. We studied the ridge lines to see how (and if) they connected. Wes pulled together all of his ancient USGS quadrangle maps (“quads” for short–a different meaning than this runner is used to). They were well loved, edges worn, holes and lines from the constant folding, dirt and sweat, yellow highlights celebrating the many peaks that Wes had already visited. On March 29, we met in a dirt parking lot at the intersection of Hwy 6 and 93. It was 7am–Wes is also not a fan of early starts. A few logistical challenges were in store for us for the day. The start was in a neighborhood and we did not want to trespass but also wanted to honor our pledge to avoid trails. And while we knew which peak was to be the last of the day, we had to find a place to park along Highway 6. We lucked out–roadside sign indicated a parking lot. 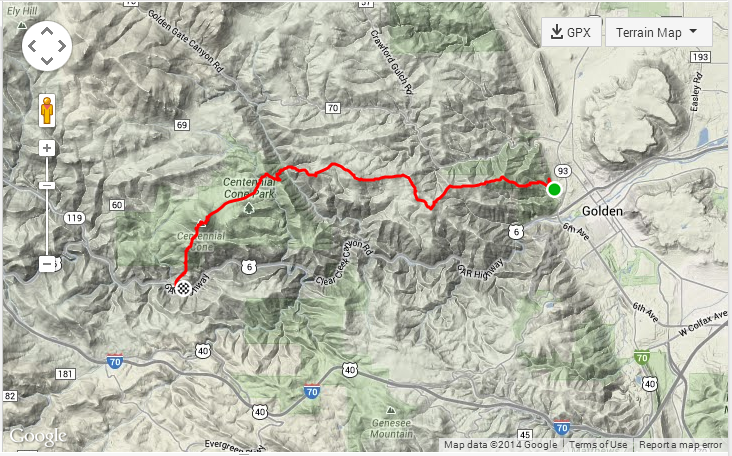 Wes estimated the day would be about 8 miles and 4,000 feet of elevation gain. Considering this would be all off trail, it was a daunting day. From my view, we were also lucky on the start–a trail head exactly where we wanted to begin. I used the getting-arrested-for-trespassing argument to sway him. He grudgingly agreed, not happy to start our adventure by breaking the rules. I, in turn, agreed to leave the trail at the first chance possible. The first chance ended up being a large gully filled with willow and evil brush with very sharp thorns. Wes gave a grin and plunged right in. One step and I felt I was in the enchanted forest, vines wrapped around my legs, knocking me over and tearing my fortunately already-well-used jacket. I bravely extricated myself, only to see Wes well ahead, on the ridge, grinning happily. I couldn’t help being infected by his enthusiasm. The first peak was Galbraith, a popular peak in the area. The trail on which we began ended there. We carefully walked next to it. Our routine became to take a quick break on each peak, pulling out the maps (we crossed three quads that day), making sure we were where we thought and checking the route to the next summit. Most of the peaks were not named, known only by their elevation. There were no bragging rights here. The next couple peaks were uneventful, but happily devoid of willows and thorns. On a couple of the peaks were registers, small notepads in glass jars where “peak baggers”, people out to summit as many peaks as possible, could sign their name and date. On the fourth peak of the day, there was one with Wes’s name on the first page. His summit was ten years earlier (in comparison, a peak I climbed in Tucson replaced the register monthly, due to the numerous visitors). I could not help to think how amazing that was. Wes’s 60th birthday had been a couple weeks prior. 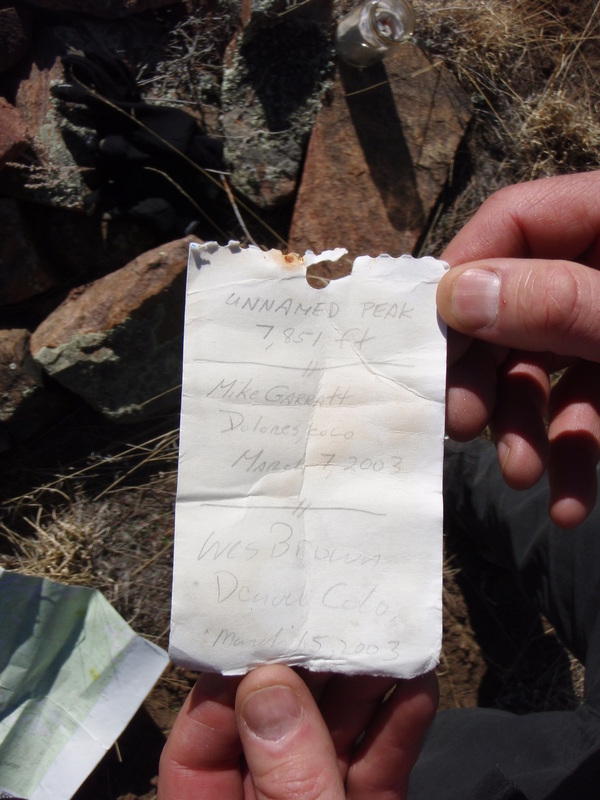 The register wouldn’t last forever, but here was a small memento of a previous hike, a day in his life, a small memory. It was truly an unremarkable little peak, but there it was. I wondered if I would recognize any other names adorning the pages. I’d always thought I would remember every peak I ever climbed, but even with my limited number, some of them ran together, and I’m left with the happy emotion of the memory. The random highlight of the day was a pump seemingly in the middle of nowhere. There were no roads, no fences nearby. I don’t even remember seeing cattle. And it worked! Wes and I decided they were a must-have for all trails. Europe had their cafes–we would have our water pumps. We were down to the last two peaks and a choice we had not been looking forward to. The ridge swung wide of our goals, which meant adding miles to a day that had already surpassed our estimates. The other option was a very steep drop of over a thousand feet, and then regaining it on the other side of the valley, never a happy option and even less so then. We had worked hard that morning to gain the ridge line. We sadly bid farewell as we began to slip slide down–well, I began to slip side. Wes was a sure footed as ever. As we descended, we came across remnants of an old mining road from the 1800s. Wes told me about the challenges of building the roads and then traveling them–how this was probably once a toll road. Another of Wes’s passions is maps and the history surrounding them. For example, in China (many years but I could not tell you how many), maps were considered power–to know the terrain meant being able to leave your village, possibly to invade another. Very few maps exist from that era. Wes is on a quest to acquire one. My mind wandered back in time, trying to picture anyone or anything traveling on these narrow, rocky routes. 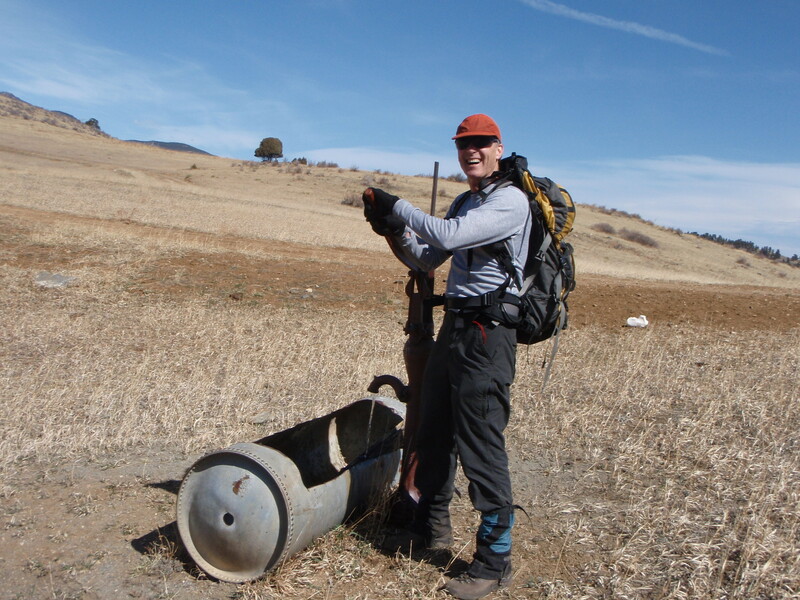 One aspect I truly love about off trail is the surprise of long ago relics, the ghosts of eras long gone. Who had ridden once where I now walked, what their life had been about. Whether they appreciated the view or only saw the difficulty. In village in Nepal, I had met a man who had told me where I saw beautiful vistas, he only saw hardship. I don’t think he was being negative–it was the reality of his life, that those vistas brought danger and struggle to the villages within them. Too quickly, we were at the valley floor, staring at the steep line back up. Throughout the day, Wes and I took turns leading. It was a nice break from navigating and route finding, especially as the day wore on, to be able to put your head down and just follow the legs in front of you. Wes is the faster hiker, so led most of day, but I had endurance in my favor, and now it was my turn. 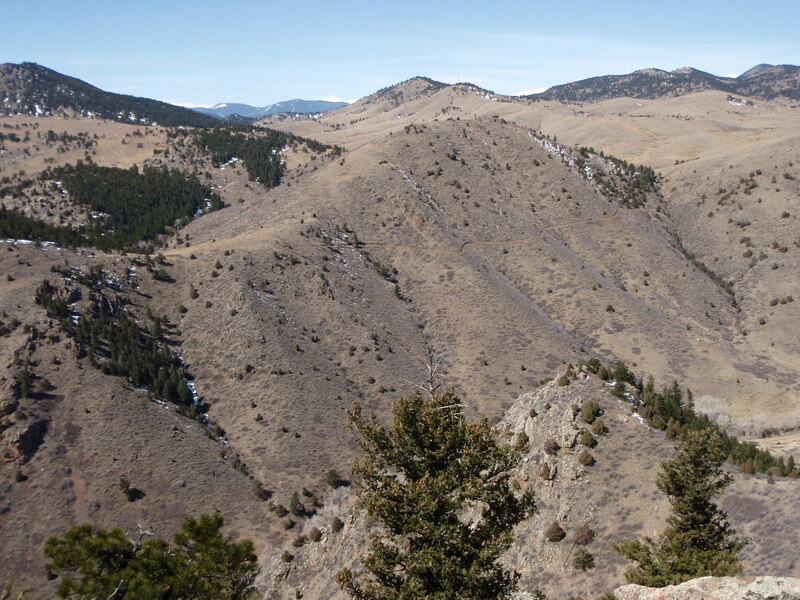 I made small switchbacks up the steep terrain to the next peak, pausing every now and then for a breath and quick scan of the terrain, making sure there were no rock outcroppings or thick willows in the way. We were quieter and slower, but still moving. 1500 torturous feet later, we were back on top, ready to plot the route to the final peak and also the highest peak of the day: Centennial Cone. Down once again and ever slower back up. Centennial Cone is in the middle of Centennial Cone park, a popular running and mountain biking area, so we crossed a couple of trails to our goal. It was the first time that day that we saw people. There was one young hiker on the peak. We were exhausted, but proud of our accomplishment. We tried to show him where we had started. He didn’t seem impressed–I suspect we were not making much sense. Per our habit, we pulled out the map. The bad news was this was also our starting point for the next segment. We’d be climbing over two thousand feet. We scoured the route and found a small peak between us and the car, almost 500 feet lower. Feeling almost smug, we made our way to that peak. 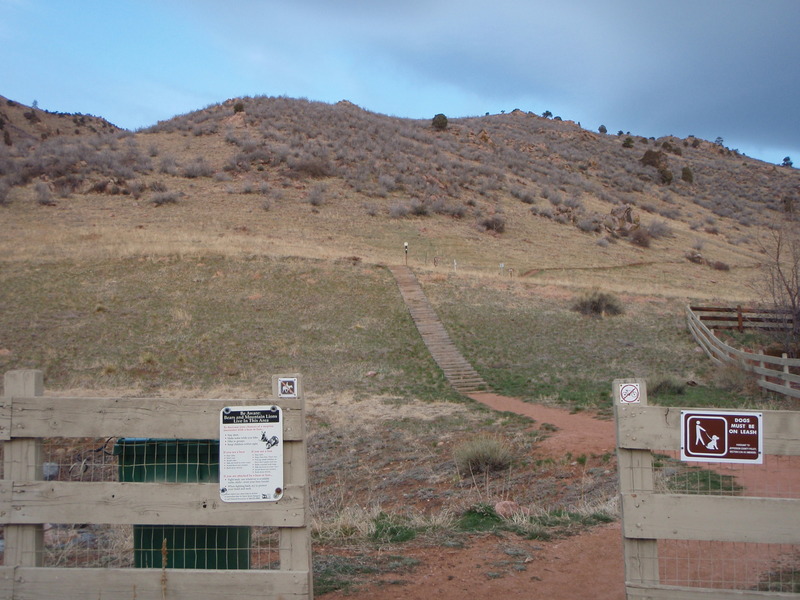 It was not necessarily good news that it was all downhill to the car–one fact you learn hiking in Colorado is that down is not necessarily the easy part. Your already sore toes bang mercilessly on the front of the boots. That spot you weren’t sure about is now officially a blister and quickly growing bigger. The quads and calves are already shaking like a snow globe. Slippery slope becomes more than a logical argument. With a mix of pride and a just touch of letdown, we descended the last steep bit straight to our car. Without GPS, we had ended exactly where we intended. The maiden voyage was done. We had completed the first leg of the Long Lonesome Trail. Great story Lynda!!! You convey many of the same emotions and I thoughts I have while out in the wild. I really do want to come with you guys sometime! !